From the moment you enter our office, we will do whatever it takes to help you feel comfortable and like a part of our family. We are ready and willing to listen to your concerns as well as your goals, in the hopes of deciding on a successful treatment plan. Most importantly, our team strives to improve your oral health and well being. We want to rid you of any fears or embarrassments related to your smile. Our primary objective is to make a difference in people's lives and to exceed their expectations. We are fortunate to work with some of the best dentists and support teams in the country who are always ready to help us achieve your goals. We are here to make a difference. Our state of the art technology, such as the Carestream 9300c Cone Beam CT Scan machine produces clear pictures of your jaw and mouth. This allows Dr. Weinstein to create an individualized treatment plan to address your problems. We provide thorough and simple explanations of Dr. Weinstein's recommendations, estimates of the recommended treatment, and how therapy is done in our office. As well, Dr. Weinstein is on call 24/7 to answer any questions that may arise. 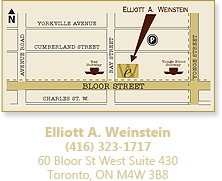 Our convenient location is wheelchair accessible and is easily reached by subway, bus, or car. Our multilingual staff that is always ready to help. Our patients appreciate the flexible payment plans and financial arrangements that are designed to meet their needs. Dr. Weinstein provides a wide range of periodontal, implant and esthetic procedures for treatments ranging from simple, single-tooth concerns to complex, full-mouth rehabilitative therapy. For your comfort, treatment can often be completed in one visit, reducing the amount of time required away from your daily routine. As well, we offer various levels of sedation to ensure that we make your visit in our office a pleasant experience. We communicate on a regular basis with your family dentist and any other specialist involved in your treatment and will be pleased to coordinate any follow-up appointments on your behalf. Most importantly, you do not need a referral from another clinician to schedule an appointment to see Dr. Weinstein for a consultation. Just give us a call at (416) 323-1717 or fill out the form on our website and we will be more than happy to schedule an appointment.